First, I used a recipe for a mixed berry crumble pie. To save time, I used chopped walnuts instead of hazelnuts or almonds, pulverized in the blender. The recipe said to use half the crumb mixture for the bottom crust and pat the rest on top. That was too much crumbs for the top, and my husband turned up his nose at it. However, my diabetic son-in-law and my two daughters liked it and declared it delicious. There’s no picture because they finished it off. I also made a blueberry pie with no crust on the bottom and a light sprinkling of Walnut Streusel on top. This my husband accepted with Cool Whip on top. Here is the recipe for Mixed Berry Crumble Pie with the necessary changes to make it diabetic legal for 8 servings. Set oven at 450. Mix nuts, flour, and sugar. Cut in margarine with a pastry blender or 2 knives. Press 2/3 of mixture into bottom and sides of a 9-inch cake pan. Mix cornstarch, sugar, and Stevia. Stir into berries. Pour into piecrust and sprinkle rest of crumb mixture on top and bake 30 minutes. Cool 10 minutes. Heat oven to 425 degrees. Wash berries, drain in colander, and put in medium bowl. Mix sugar, Stevia, cornstarch, and nutmeg, and stir into berries. Pour into 9 or 10 inch glass, ceramic, or tin pie pan. Cut margarine into flour, sugar, and nut mixture with a pastry blender or two knives. Sprinkle over blueberries and bake for 35 minutes. If you only have 12 oz. blueberries, use a smaller pie pan. 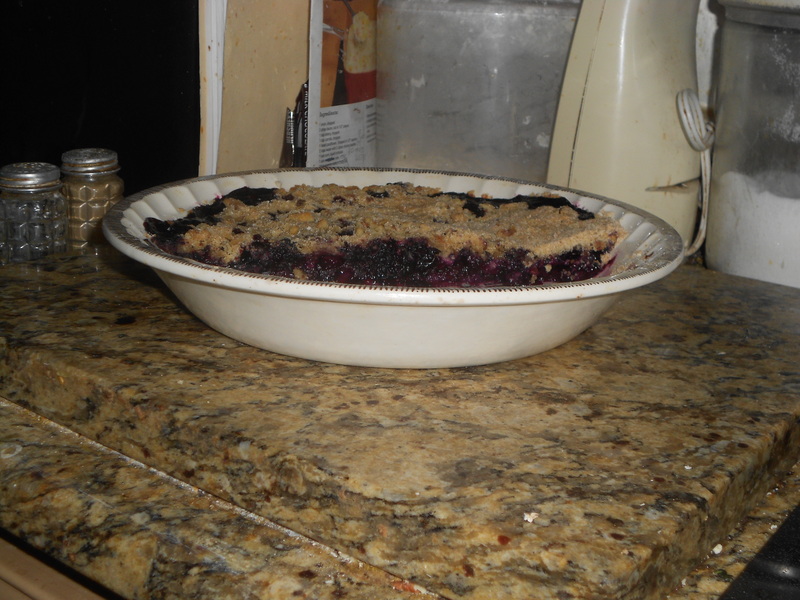 This entry was posted in Delicious dishes and tagged Blueberry Pie, Crustless Blueberry Pie, Mixed Berry Crumble Pie. Bookmark the permalink.